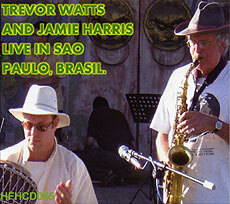 Trevor Watts, saxophones, percussion; Jamie Harris, percussion, voice. Recorded 27 July 2005 at Teatro Popular Do Sesi, Sao Paulo. Photograph (front cover reproduced above) by Karen Fischer, Alan Teller or Margaret Richards.